UPDATE: Tickets must be procured in advance. They are available here. 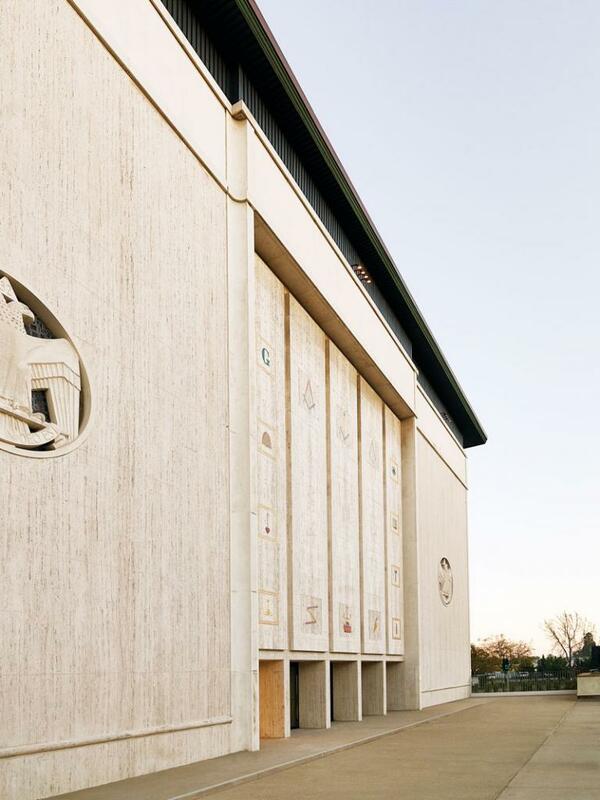 When brothers Maurice and Paul Marciano bought Wilshire Boulevard’s midcentury Scottish Rite Masonic Temple—you know, that hulking building near Hancock Park with the 14-foot-high travertine sculptures of George Washington, King Solomon, and Saint John the Baptist on its facade—among the many abandoned Masonic objects they inherited was a rectangular block of raw stone with a serial number on the bottom. “We were going to throw it out. We didn’t know what it was,” says Jamie Manne, deputy director of the Marciano Art Foundation, the new and interestingly unconventional 110,000-square-foot museum set to open on May 25 inside the building. It will feature selections from the Marciano siblings’ personal collection of more than 1,500 contemporary artworks that focuses heavily on L.A. artists. Marciano, who is 67, has long been fascinated by material transformations—but ones that are more about making things perfectly less than perfect. As one of the founders of the L.A.-based Guess clothing brand, he ushered in the denim revolution of the early 1980s by introducing stone-washed jeans to the United States. “It was all about the process,” says Marciano, his white hair a sharp contrast to the dark blue jeans he’s wearing (Guess, of course). Early on he remembers persuading a commercial laundromat in downtown L.A. to let him wash denim with pumice stones to give the fabric a lived-in look. To create creases in jeans, he, Paul, and two other brothers, Georges and Armand—all of whom were born in Morocco or Algeria and immigrated to Los Angeles from France—would add some resin to the process. “I love denim because it’s so versatile. It’s endless what you can do with it,” Maurice says. 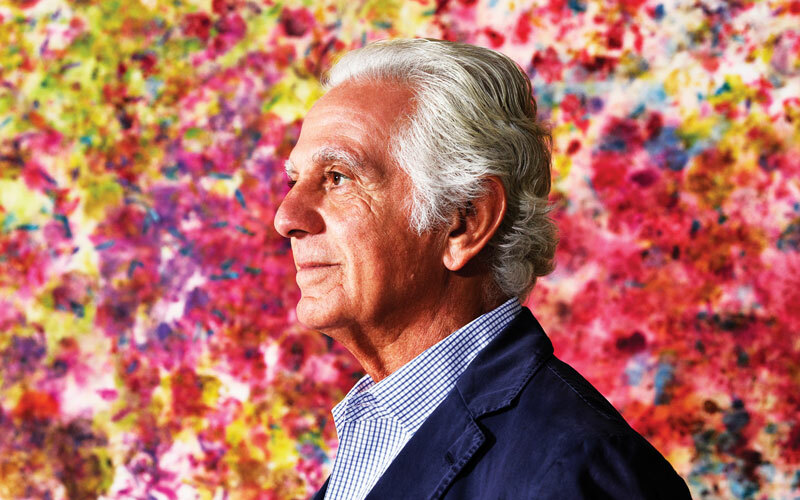 Maurice marciano began to embrace being a patron of the arts more fully after stepping down from Guess in 2012 (his brother Paul remains the company’s executive chairman); that same year he joined the board at MOCA. Today he and Manne are visiting an art studio in Santa Monica. It’s an industrial-looking space just off Main Street, where Analia Saban, a 36-year-old artist from Argentina, engages in a bit of transmutational work herself. In one corner is a medieval-looking contraption, a table that’s about the length of a human body and covered in vises and clamps and a rolling mechanism. Built by Saban, it’s designed to slowly crush rock. The artist and her studio assistants, in a process that took three years to master, can feed a slab of concrete (cast with a wire framework inside) through the machine without wholly breaking it. The slab becomes a sort of rubble blanket that can be folded and hung. The result, says Saban, “is very hard to imagine. But it happens all the time in L.A. with earthquakes. The street folds.” Marciano is as engaged in enthusing about Saban’s work (“Love, love, love,” he says) as he is in asking her about how it’s all done. “I love talking to the artists. Would you think up something like that? It’s amazing,” says Marciano. Saban is among the Marcianos’ most-collected artists. They own 13 pieces by her, three of which are in the museum’s opening exhibition, Unpacking: The Marciano Collection, including a blanket made of solid stone. The show occupies a large gallery on the top floor of the building. Once the temple’s ballroom, where members held 2,000-person dinners, it’s now the most conventional gallery space in the museum, whose renovation was overseen by architect Kulapat Yantrasast of wHY. What’s surprising is how removed this gallery is from the entrance on Lucerne Boulevard. Given more prominent billing is an enormous black-box room on the ground floor that used to be a 2,400-seat theater. 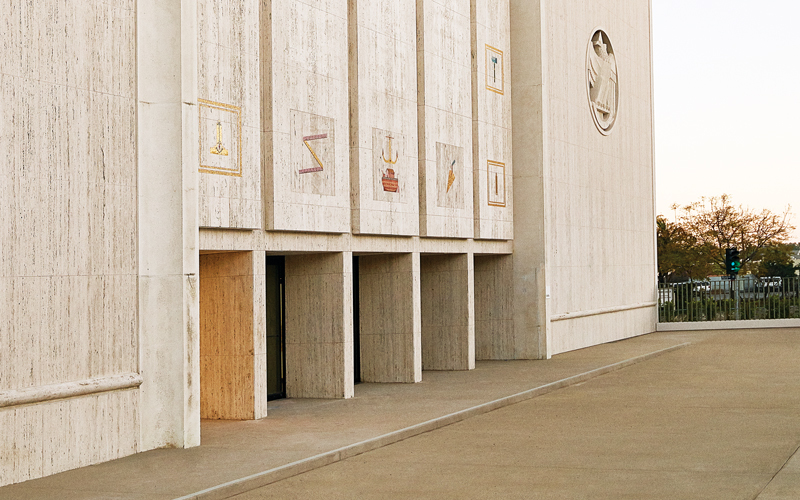 After the city compelled the museum to remove all of the theater’s seats (because the parking lot has space for only 200 vehicles), Marciano fell for the newly revealed raw space. Saban sees why. “It’s like a cathedral. The scale is unbelievable,” she says. For the opening, L.A.-based artist Jim Shaw has created large installations that incorporate four theater backdrops left behind by the Masons, whose club activities included mounting historical morality tales featuring elaborate costumes. “I wanted to have a place not just to exhibit art but rather for the artists to come and get inspired and do whatever they want. We’ll just let things happen,” says Marciano. Stage Gallery, as the Marcianos are calling it, is a sign of how they are seeking to distinguish themselves in a city that is in the midst of a wave of museum building, from 2015’s debut of the Broad to the upcoming Academy Museum of Motion Pictures. “We want everything to be kind of organic. I don’t want it to become like an institution. We don’t need another institution. We want to experiment,” says Marciano, who also intends to have a small museum within the museum that showcases Masonic memorabilia. So far, though, they have yet to find the perfect ashlar, “which is how we prefer it,” says Mann. Clearly they’ve got different aspirations. Previous articleAn Inside Look at the Lowrider Culture of East L.A.